There were a few days here and there the past few weeks that were so warm it was almost like I was in a different state. I thoroughly enjoy it. There are few things in the world I hate more than having to layer up with bulky winter coats, so being able to head out without one on is perfection. 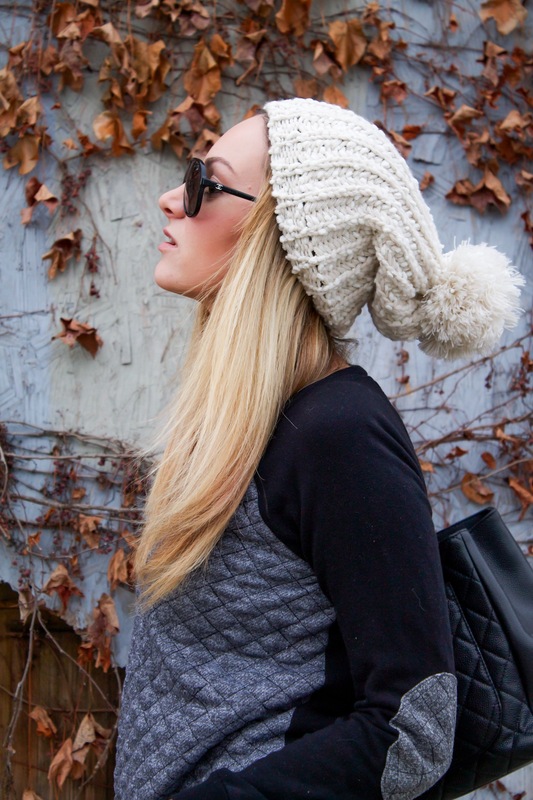 I adore knit hats. I used to be a winter hat only kind of person, same with sunglasses. I would ONLY wear aviators because I thought everything else looked weird on me. I blame it all on my small head. Anyway, since I loved winter hats so much I own like 100 of them…well that’s a small exaggeration but you get the picture. Also, have you tried on American Eagle jeans yet? I’m actually kind of obsessed. They fit SO GOOD like they are custom made for me. The jegging jeans are insanely comfortable and the fact that they run in shorter sizes, YES. Amazing. Too bad the next time I’ll be wearing this outfit no one will be able to see the lovely quilted detail and patchwork sleeves because it’ll be under layers and layers of winter gear. BOO. So now it’s time to announce my giveaway winner!!! Congratulations to Erica McGuire! You have won $100 to Amy Coe at Babies R’ Us! Please e-mail me at TheRachel.Ross@yahoo.com to claim it! [You have 24 hours] <3 Congrats! I’ve had this vest for months now and it has just sat in my closet. I had a complete outfit put together in my head, I knew exactly what I was going to wear it with….but I didn’t actually own any of the other pieces to my fantasy outfit and I couldn’t find them anywhere, HA. It wasn’t until I was getting ready to pack all of my maternity clothes away that I found a missing piece; this GAP dress that I wore up until I was 8 months preggo. I can’t say enough good things about these boots, seriously. Whenever I wear them I instantly feel just a little bit more glamorous. Especially since by the end of the night I’m not limping and hobbling to my car to change my shoes. These boots are legit. Don’t forget to enter my giveaway with Amy Coe for a chance to win $100 to Amy Coe at Babies R Us! The giveaway ends on Monday, so spread the word! Click the link below to enter. disclaimer: the link hasn’t been working for everyone SO if you find yourself having trouble just follow the steps below, leave a comment when you’ve completed everything! The entries with Rafflecopter and the manual entries will be combined! Good luck! click here to win $100 to Amy Coe at Babies R Us! Now, a little secret here, I’ve never actually watched an episode of Scandal. Seriously. However, I don’t live under a rock. It’s pretty much common knowledge that the words ‘Olivia Pope’ and ‘style’ go hand in hand. I’ve seen enough tabloid photos and E red carpets to catch on to what Olivia’s style is all about on this show: she stays in a neutral color palate, dresses somewhat modestly while still managing to show off her amazing figure, loves structured bags, and fabulous coats. I noticed Kerry Washington’s character typically uses some sort of color blocking to show off her insane figure. I didn’t have a color-blocked dress on hand, that was deemed appropriate, so I chose this amaze belt from H&M to sinch my waist and show off a little bit of my womanly figure instead! Notice I didn’t say girlish… after 2 kids I am one big ball of curves, haha! Also, Olivia always has the sickest jackets and coats, BUT, since it’s the middle of August I was not about to throw myself in a wool or fur coat. But I do think my gorgeous London Fog trench gets the point across. This was a fun character to style and shoot! It’s so strange, I was so excited to style Rachel (from friends, not talking about myself in the 3rd person) and I had the hardest time with her look! Olivia’s was easy, she is elegant and classic but oh-so-chic! Anyway, as announced previously we’re giving away 2 more fabulous pieces of jewelry (graciously donated by Roman & Sunstone and Roman Luxe!) that we think perfectly match Olivia Pope’s style! Since she is somewhat understated when it comes to accessories, we chose classic pearls and CZ studs. ENTER $600+ ROMAN & SUNSTONE AND ROMAN LUXE GIVEAWAY HERE! Follow these gorgeous bloggers to see more of their take on Olivia Pope’s style! Shop my Olivia Pope collection with Mavatar to emulate her style yourself! 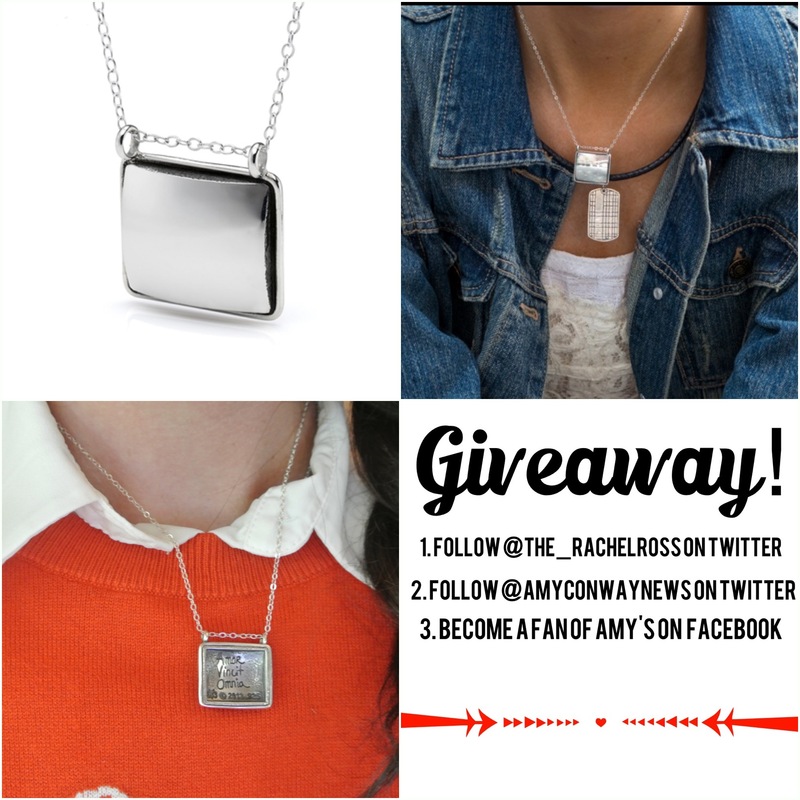 A special thank you to everyone who has already entered in my giveaway collaboration with Amy Conway Jewelry, but if you haven’t entered yet there is still some time left! That’s ALL you have to do! Just follow those 3 easy steps! Feel free to leave me a comment here when you’ve completed the steps just to make sure! (for more details & links, see my previous blog post!) I will be picking & announcing the winner on Monday, September 30th, so get to it! Until next time, kisses! If there’s one thing I really love, it’s fashion for a cause. Nothing makes you feel better about shelling out some cash for clothes and accessories then knowing a portion of what you spend is being put back into the community in one way or another. When I discovered Amy Conway and her vast collection of jewelry and scarves I was delighted to find out this was exactly what she’s been doing. Amy has a very clear mission: to empower women through art and love. A portion of all of her sales goes back into a program she founded herself called Love Truly Matters. This is a foundation that supports organizations that provide services to help empower women. It kind of warms my heart to know people like Amy exist! Not only does she create beautiful and exquisite jewelry, but she truly cares about her customers! What could be better? To celebrate my own love for this designer, we’ve teamed up for a very special giveaway! 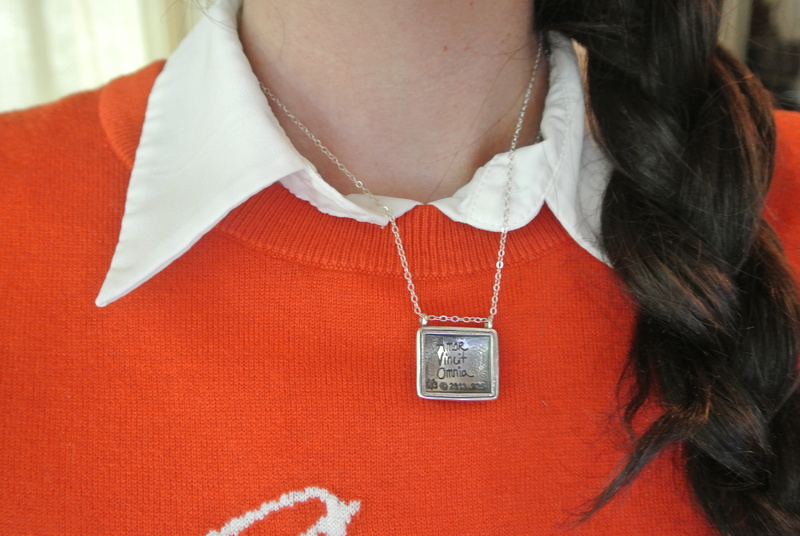 You yourself could win this gorgeous “Love Conquers All” necklace. 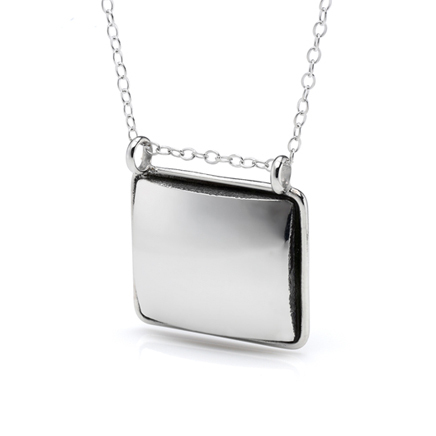 The sterling silver necklace rests on a 16 inch sterling silver chain. One side is solid silver and inscribed on the opposite side are the words “Amor Vincit Omnia” translated to “Love Conquers All.” This is one of my favorite pieces, I love the message it sends. This necklace retails for $245.00 but you have a chance to win it for FREE! Who doesn’t love that? And it’s super easy to do! Just follow the steps below. Once you’ve done all three feel free to leave a comment here or tweet to us so we know you followed! I will be picking a winner next Monday, September 30th so you have plenty of time to enter! Oh and you can shop Amy’s full collection here. Also! As we all know I’m an East Coast based blogger so to all of my East Coast friends out there, you have a chance to meet Amy Conway herself as she presents her Fall 2013 sterling silver and scarf collections at Henri Bendel today through Wednesday! The address is 5th ave, 56th Street, New York, NY 10019, 2nd floor! Have fun and good luck! Until next time, kisses! Congratulations to Valerie! What stood out to me is the type of outfits she said she would style her Linea Pelle belt with; she even left visuals! The look of this romper with the LP belt was what made up my mind; she has great taste! Valerie – send me an e-mail to TheRachel.Ross@Yahoo.com to claim your prize. Congratulations! Hey folks! Just a little reminder, the deadline for my Linea Pelle giveaway is tomorrow! Well… I guess technically tonight. I will be announcing the winner tomorrow afternoon (New Jersey time) so be sure to get all of your friends who haven’t signed up yet to do so now, this is their last chance! In case you forgot… this is what the gorgeous prize looks like! All you have to do to enter is follow Linea Pelle on Facebook, leave a comment in the original post about how you would style this belt, and follow moi on Twitter and re-tweet and Linea Pelle related tweets I post. To do all these things… simply click here. This will take you to my original post and you can see all the details and rules for yourself. Considering it’s pretty much maxi dress season across the US and this belt would look killer with a maxi dress and some boho stripy sandals, you’d be cray cray not to sign up! Good luck lovies! Have you guys been sucked into the black hole that is Polyvore yet? Because I have. Add creating outfits to the pinning madness that is Pinterest, and I am officially useless, it’s all I do! Polyvore is this amazingly fun website where you can literally design your own outfits. You can play stylist for a few hours (or, not just a few in my case). The website takes real items that you can actually buy so your dream outfit doesn’t necessarily have to be just a dream. Although, if you’re like me and don’t pay any attention to the brands or labels until after the outfits finished, it may just be a dream outfit, hah. I post all of my outfits to my Pinterest and my Tumblr but these are a few of my favorite looks I’ve created. You literally go through categories titled “shoes” “accessories” “dresses” and whatnot and pick out your favorite items and this what comes out of it. If you haven’t played around on Polyvore yet, be careful! It can be addicting. Thank goodness I’m currently unemployed because I’d probably get fired for spending so much time on here, haha. Visit Polyvore.com to become obsessed like I am! Recognize the coral tote with the 3rd outfit? You should, it’s one of my favorites from Linea Pelle! Speaking of… If you’ve missed the announcement of my giveaway on Tuesday, you have until next Tuesday to enter! Check it out here. I’ve teamed up with Linea Pelle to give away a gorgeous vintage belt to one lucky blog reader! You really don’t want to miss out, it’s a gorgeous belt valued at $180(ish) and you can grab it for free! Good luck! ;] xo. Linea Pelle Vintage Belt GIVEAWAY! This beautiful leather belt is known as the Jesse vintage wide hip belt. It’s valued at $187.00, but you can get yours for free! There are three things you can do to increase your chances in this giveaway and they’re all super easy. 1. Become a fan of Linea Pelle on Facebook if you aren’t already by clicking here. 2. Post a comment on this post below with your name, where you’re from, and how you would style this belt with any outfit. 3. Follow me on Twitter and retweet any tweets you see about the giveaway. It’s that simple folks! We’ll announce the winner this time next week, so you have plenty of time to enter and plenty of chances to win. The more you participate the better your chances, so don’t miss out! Good luck! *please note this giveaway is only open to US residents.